When someone signs up for Smoked Meat Sunday’s newsletter I send a thank you email with a simple statement: If you’re willing, reply to this email with your biggest challenge when it comes to smoking meat. I get a lot of replies to that email, and the most common response is: how much time to smoke (insert meat here)? I’ve replied to all of those emails with my best recommendation, and in this post, I’ll share those answers with you. When you are preparing a meal for your family and friends, timing is everything, right? You have to be able to give them at least a ballpark time that all of the food will be ready to go. When you’re cooking food on a regular gas or charcoal grill, that’s easy to do. That’s also a great way to make food that is not the best it can be. The best barbecue is cooked low and slow on a smoker. That low and slow concept throws a major wrench in timing though and means you’re going to have to do some planning if you want your meal to be served at a specific time. In this case, our end goal is a specific internal temperature. What Temperature Does My Meat Need to Be Cooked To? The first thing we need to know before we start a cook is what the end temperature needs to be. Fish should always be cooked to an internal temperature of 145 degrees. Chicken should be cooked to an internal temperature of 165 degrees. Pork products, (think hams or pork chops) should be cooked to an internal temperature of 145 degrees. If you’re going for pulled pork, the end goal is an internal temperature of 203. Cuts of beef should be cooked to an internal temp of 125 for rare, 135 for medium-rare, 145 for medium, 155 for medium well, and 160 for well done. If you’re making brisket, or shredded beef with a chuck roast, go for 205. So there’s something that’s really been bothering me lately. I spend quite a bit of time reading about how people cook certain meals, and the different tactics they use to get different results. There’s a faction of people giving advice on smoked meat forums – yes that’s a thing – saying that they just go by look or feel to know when their food is done. If you’re just cooking for you, go for it. Roll the dice on serving food that’s not up to temp. If I’m cooking for someone else, I ALWAYS check the internal temperature with a calibrated instant-read thermometer. My Traeger has two probes built in that I can use while the meat is cooking, but those probes are not always 100% accurate. They are better suited to use as a guide. The best solution is to get a Thermapen. Thermapen’s are the fastest most accurate instant-read thermometers on the market. When I’m nearing the finish line with a cook I can open the lid on my Traeger, insert the Thermapen in the thickest part of the meat I’m cooking, and have a 100% accurate readout in two to three seconds! Yeah, they cost money, but it’s an investment in a tool that should last for years if you take good care of it. Buy your own Thermapen HERE. There are a ton of different options when it comes to meat thermometers. If the points I mentioned above aren’t important to you, you can save a few dollars by purchasing the ThermoPop. The ThermoPop is a few seconds slower, but if you’re trying to save a few bucks, it will still do the job! Now that we understand our end goal – cooking to a specific internal temperature. It’s easier for us to get an understanding of how long it’s going to take to cook the meat. 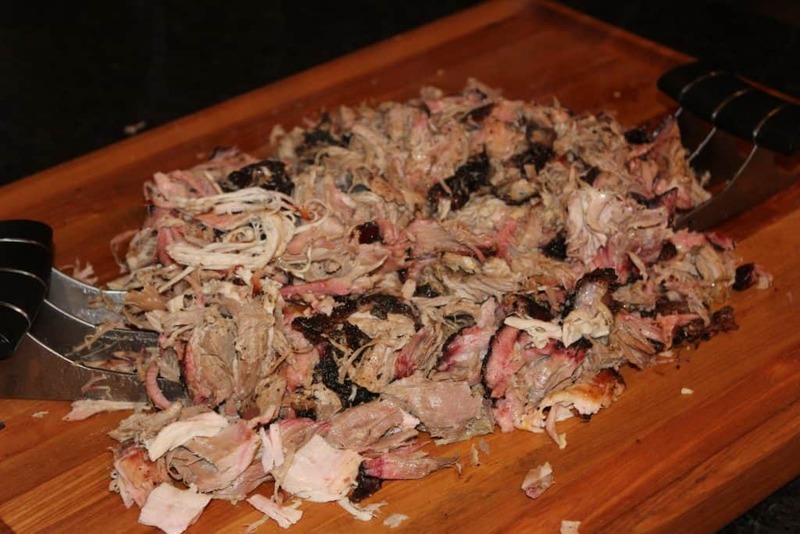 How Much Time to Smoke Pulled Pork? First up on our list, is pulled pork. Pulled pork needs to cook to an internal temperature of 203 degrees. I almost always cook pork shoulders at 225 degrees and plan on approximately 90 minutes of cooking time per pound. That means a ten-pound pork shoulder should take approximately 15 hours to cook. Now, there are some variables that come into play here, and that’s why the 90 minutes per pound rule is an approximation and not an absolute. When you start smoking a pork shoulder the internal temperature will gradually rise at a somewhat steady rate, until it hits 160-165 degrees. At that point, you’ll experience the dreaded stall. A stalled pork shoulder is enough to make a man go insane, but if you know what to expect, and what your end goal is, you’ll be ok! I’m not going to get into the science of the stall. 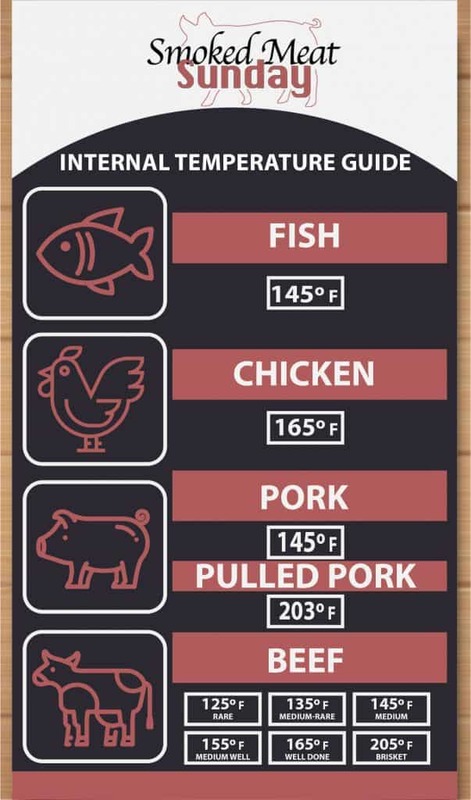 Just know that when your pork shoulder gets to that internal temperature of 160-165 degrees, the temperature will stop rising, and it could stay at that temperature for HOURS. I’ve had pork shoulders stall for 5 hours before! When I’m cooking pork shoulders I pay close attention to the internal temperature. When the temp hits 165 degrees, and my stall has exceeded 2 hours, I take the pork shoulder out and put it in a 12 x 10 disposable aluminum tray. I put a 1/2 cup of apple juice in the bottom of the tray, and then cover the tray and pork shoulder tightly with aluminum foil. When the pork shoulder is covered I put it back in the smoker, and turn the temperature up to 250 degrees. I know from experience that this will force the pork shoulder to push through the stall and help you get up to that magical temperature of 203 degrees. If the meat still hasn’t pushed through the stall after an hour of being wrapped, you can inch the smoker temp a little bit higher, but I wouldn’t go more than 275. You still want the pork shoulder to cook slowly to let all that fat and connective tissue melt away. When your pork shoulder has finally made it to the magic temp of 203, it’s not time to serve! It’s time to let the meat rest. Put that aluminum tray in a cooler, and then fill that cooler with towels, and let it rest for at least an hour. I prefer to let my pulled pork rest for 2 hours! Allowing the meat to rest this long will let the juices redistribute, and help you get that fall apart goodness you’re going for. Bottom line, I always plan on 16 hours for a pork shoulder cook. If the meat finished before it’s time to eat, that’s fine! I just let it rest in my cooler. I’ve let shoulders rest for 5 hours in the cooler, and when I removed them to pull, they were still too hot to handle without oven mitts. How Much Time to Smoke A Brisket? Smoking a brisket is similar from a time perspective to smoking a pork shoulder. The 90 minutes per pound guide still applies. I try not to wrap briskets at the stall, and I’ve had good luck with briskets pushing through the stall, and staying on time. You can wrap them if you must to speed things up, but if you do I’d recommend wrapping them in butcher’s paper instead of foil. Don’t forget to let the Brisket rest! Bottom line, plan on a 10-pound brisket taking around 16 hours from start to finish, including the rest. How Much Time to Smoke Ribs? 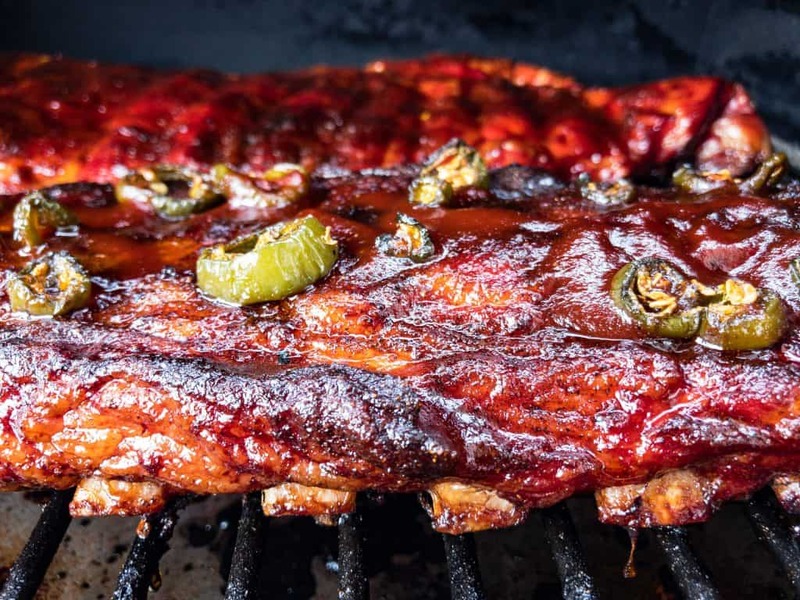 I keep it fairly simple with my ribs, and my go-to recipe for ribs is the 321 method. Know what’s cool about the 321 method? the 3 stands for 3 hours, the 2 stands for 2 hours, and the 1 stands for 1 hour. A rack of ribs takes 6 hours to smoke, and then I like to let them rest for 30 minutes before serving. Bottom line, plan on a rack of ribs taking 6 and a half hours. There are other ways to cook ribs, and some of those methods take less than 6 hours. That’s ok! Finishing early is never an issue, at least when it comes to barbecue… If your cook finishes early, just wrap the meat in foil, and place it in a cooler. I’ve let racks of ribs rest in my cooler for up to two hours and they’ve been just fine! How Much Time to Smoke a Chicken? 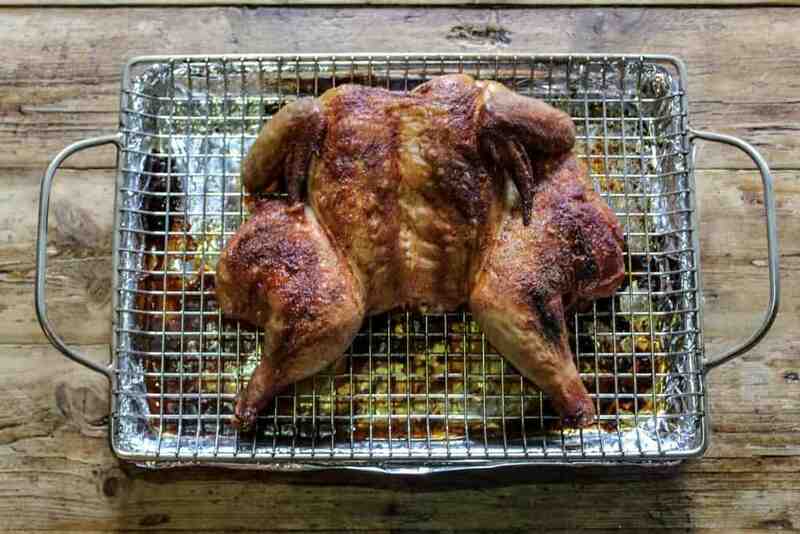 Smoked Chicken is delicious on the smoker, and it’s super easy to prepare. I like to cook chicken at 250 degrees, and I always estimate about 40 minutes per pound of chicken. Again, that is just an estimate! Chicken isn’t safe to eat until the internal temperature is 165 degrees. 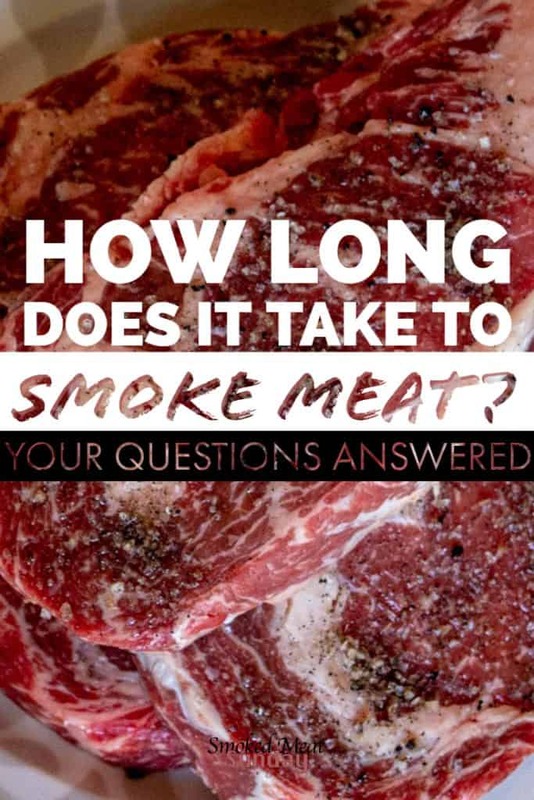 How Much Time to Smoke a Steak? Steak is super easy to cook on a pellet smoker, but it is a different process than what most people are used to. I always use the reverse sear method to cook my steaks. The reverse sear method is great for cooking hamburgers too! I cook my steaks and burgers at a temp of 150 for about an hour. Then I remove the meat from the smoker and crank the temperature up to high. When the smoker is up to temp, throw the steaks or burgers back on – put them in a cast iron skillet for this last step to get a KILLER crust on the outside – flip the steak or burger after a few minutes, and cook to the desired internal temp. In this post, I’ve covered all the key temps, and the time it takes meat to reach those temperatures. Remember, all of the timing info provide in this post is just a guide. No one truly knows how much time your cooks will take, and the only way to know is to keep good track of your internal temperatures and cook more foods on your smoker. The best way to make good barbecue is to make bad barbecue and then learn from your mistakes. I hope you’ve found this post helpful. If you feel like there are some questions I’ve left unanswered, let me know in the comments, or send me a DM on Instagram or Facebook. Love this post? Check out my Tips for Smoking Meat. Smoking Meat in the cold? Then you’ll want to check this one out too!